If you are convicted of a criminal offence you might, in addition to the sentence imposed by the Court, face confiscation proceedings under the Proceeds of Crime Act. If you find yourself in such a position Cohen Cramer Solicitors can help you. The law in this respect can be very harsh and is often strictly enforced and, as a result, you might be faced with losing all your assets. You might be faced with a prison sentence in addition to the original penalty imposed by the Court. The law as well as being very strict is a minefield and you need an expert to guide you through it. We have a team of lawyers, led by Lauren Bowkett, who specialise in this area of law. We will fearlessly challenge the confiscation figures proposed by the prosecution and, together with carefully selected accountants and surveyors, have many years of experience in successfully achieving good results for our clients. One misapprehension is that the overall confiscation figure, known as the “benefit” figure, is rather meaningless because it might simply be a figure which cannot be paid and which might never be enforced. However whatever figure is ordered is owed by a client for the rest of his or her life, until it is paid. This is not the place to discuss into the ins and outs of the law, other than to say that this is an area where you need specialist advice. We are regularly instructed by defendants who have had other solicitors dealing with their cases up until the point of confiscation and we are regularly asked by other solicitors to take over confiscation cases as they acknowledge our expertise. We are happy to represent, as well, family members of defendants where the prosecution might be seeking to argue that their assets represent the proceeds of crime. We will deal with confiscation cases anywhere in England and Wales. 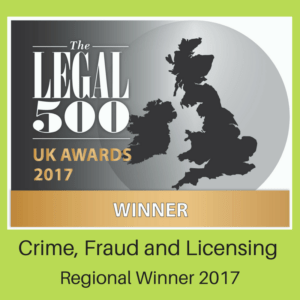 Expert Advice on Crime, Fraud and Licensing.